What can ever be better than a BBQ get together? Who does not love the beautiful outdoors, music, all the loved ones in one space, and very easy, fuss-free foods? Perhaps one of the main reasons we love BBQs is the fact that we can throw an amazing one without much fuss, we do not have to do over complicated planning, food prep and all the rest of the stuff we go through when planning seated dinners! And always, every time, it produces absolutely amazing flavours and everyone is happy with the food and the gathering. Well, it is the season and since you are all uncovering your BBQs, enjoying the outdoors and are very likely to throw some talk of the town BBQ gatherings, I thought why not share with you an amazing marinade recipe that works very well for poultry and fish? 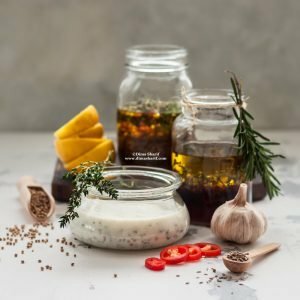 You will love making this marinade that really takes no time, in which you will soak your chicken or fish for an hour or two before throwing over the grill, that will pack your food with flavour and tenderness. Just make a couple of salads on the side, an amazing dessert and pour those drinks… turn the music up and everyone will have a great time. And to ensure all is right in your BBQ world, I have also included for you a video of the top ten BBQ tips. You can always add my gorgeous DS Pickled Zaatar, DS Organic Dried Zaatar Mix, or DS Sumac to the mix. You can also use my DS Green Shatta instead of the red for a more savoury flavour or DS Smoked Shatta for a more Mexican flavour. Finally you can add a couple of tablespoons of my DS Pure Almond Butter to the mix for a nutty flavour. They all work out heavenly, I would not recommend them, unless I tried them and tested them on a group of people for feedback, they were all loved and you will agree too. You can always make this marinade and place it in an airtight glass container in the fridge for up to 2 weeks. This way you are ready any day, anytime to marinate and grill your meat for a delicious and healthy meal. In a small bowl, mix together all ingredients, except olive oil. Once mixed, drizzle the olive oil in a thin steady stream, while mixing in order for the oil to incorporate and for the marinade to be emulsified and not split. Marination is the process of soaking foods in a seasoned, often acidic, liquid before cooking. The origin of the word alludes to the use of brine (aqua marina) in the pickling process, which led to the technique of adding flavor by immersion in liquid. The liquid in question, the ‘marinade’, can be either acidic (made with ingredients such as vinegar, lemon juice, or wine) or enzymatic (made with ingredients such as yogurt, pineapple, papaya or ginger). In addition to these ingredients, a marinade often contains oils, herbs, and spices to further flavor the food items. The marination process is commonly used to flavor foods and to tenderize tougher cuts of meat. The process may last minutes or up to days. In meats, the acid causes the tissue to break down, which allows more moisture to be absorbed and results in a juicier end product; however, too much acid can be detrimental to the end product. A good marinade is one that balances the acid, oil, and spice. If raw marinated meat is frozen, the marinade can break down the surface and turn the outer layer mushy, and so the meat has to be brought to room temperature before marinating. It is important to note here that raw pork, seafood, beef and poultry may contain harmful bacteria which may contaminate the marinade. Therefore, marinating should be done in the refrigerator to inhibit bacterial growth. Used marinade should not be made into a sauce, unless rendered safe by boiling directly before use; otherwise, fresh or set-aside marinade that has not touched any raw meat can be used. That also applies to the container used for marinating. It is worth mentioning here that it is best to use glass or food safe plastic bags for marination as metal, including pottery glazes which can contain lead, reacts with the acid in the marinade and should be avoided. With that said, glass remains the best option as plastic tends to be environmentally hazardous, unless ofcourse you use the recyclable or biodegradable bags. Finally, there are numerous amounts of marinades to choose from. Really you can get very creative here and produce unlimited options following the main principle of acid, oil, herbs and spices. The sky is the limit!